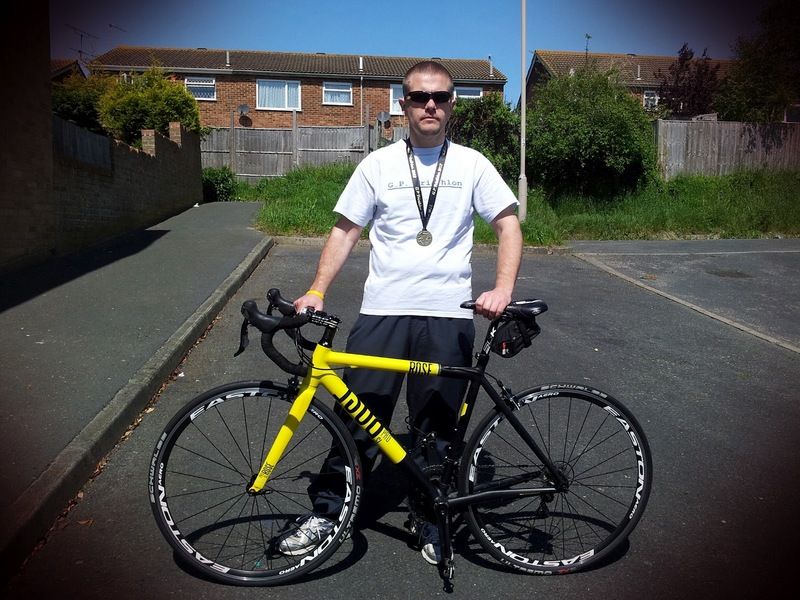 On Sunday I took part in the Uckfield triathlon. I raced the sprint distance but there was also a novice event too. The distances were 500m swim, 16km bike and 3.5km run. The last triathlon I took part in, which was also my first, was a novice event last August. Since then I've been training every week and have upped my training since the start of the year. Having thought the swim was the hardest part of my last triathlon and realising it was actually the run, my main focus has been my running. Although the run is quite short on the Uckfield triathlon, it's still a shock to your legs after swimming and cycling hard. I had an early start on Sunday. Had to get up at 5.30am. My support team (wife and kids) were coming too so they had to fight the early start. 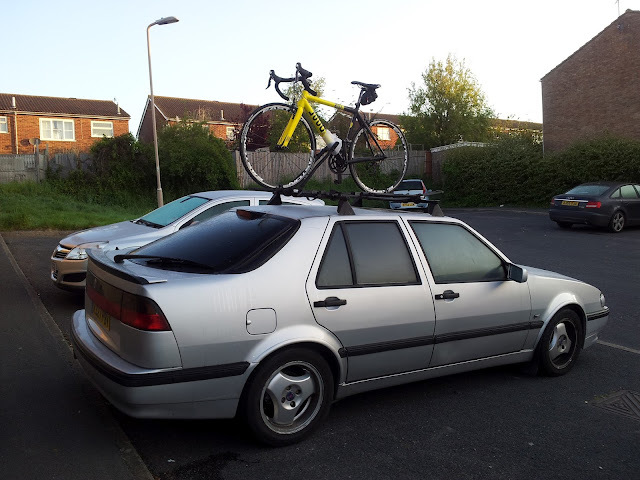 Got the bike on the car and put my stuff in that I'd prepared the day before. Got to the starting venue in plenty if time. Found out where to go set up and register. Got my race numbers and then took my bike to transition. Got a nice spot on the end of the racking and started setting up. Went through my routine in my head and made some adjustments to my stuff. Another competitor pointed out that my bike was in a high gear and I may want to adjust it. I did. I knew a couple of the other competitors doing the sprint distance. One of them I ride in to work with once a week and the other I swim with once a week. Both did the same novice tri as me last year. Incidentally, they both beat me last year too. Their pace was similar to mine though. They would be my benchmark for this event. As I'm a slow swimmer I was given a fairly low number of 14. As it happens, I would get to go in the pool with the first set of competitors. This was around 8am. I got in the water and was surprised how warm it was. I was counted down and I started the swim. The water got noticeably warmer towards the deep end. Far too warm for a race in my opinion. Each time I swam back towards the shallow end, I got a cool breeze from the exit door at the side of the pool. I managed to get into a rhythm from the start and was pleased with my pace. I wasn't sure how fast I was going though. At the end of my swim I exited the pool and ran outside to transition removing my cap, goggles and nose clip. I slipped on one of the steps entering transition and grazed the end of my big toe! I then proceeded to try and dry my feet and wipe the grit off, get my socks on and then my SPDs. The adrenaline was definitely pumping as my hands were shaking. Put my helmet on and grabbed the bike. Ran to the mount line and got on the bike. Riding out of the leisure centre, there are some serious speed bumps. Had to hop over them and avoid someone having chain issues. On joining the main road, there was a police officer stopping the traffic for me. The muscles in my legs were starting to burn already as I was obviously pushing hard. I upped my cadence a bit to keep my legs good for later in the race. You have to do two laps of the bike course and there is one set of traffic lights that you pass three times on the route. I got stuck at them twice! About halfway through the first lap I started to hear a ticking noise coming from my bike. At first I thought it was brake rub but after checking the front brake and releasing the rear I knew it wasn't that. I then thought I had a puncture and it was a hiss from the tyre. After a little while I was certain my rear tyre was going down. I pulled over and squeezed the rear and then the front trying to work out what the problem was. The noise stopped when I pulled over and I was none the wiser. I carried on, crossing my fingers in hope it was nothing serious. I finished the bike course and returned to transition. 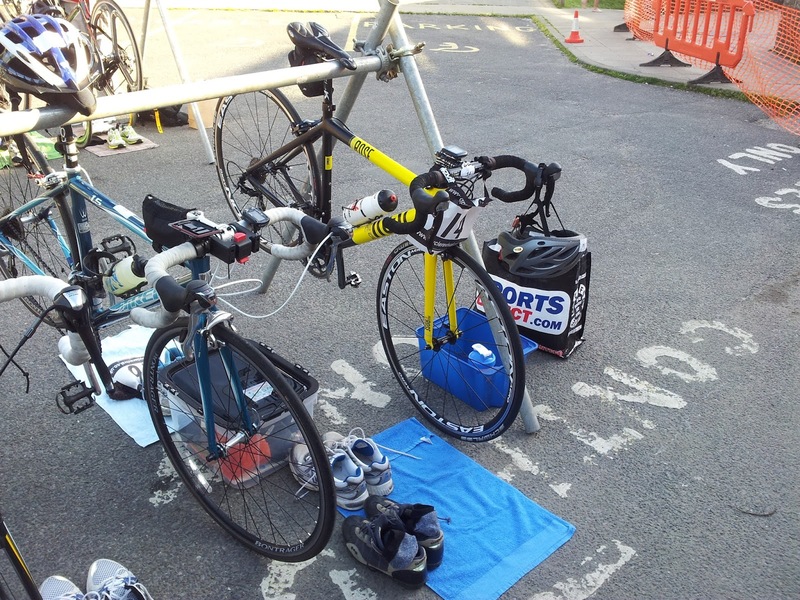 I racked the bike, changed into my running shoes and I was back out of transition again. The course starts off downhill slightly before turning left onto the flat. After a while it turns left again uphill. I was really feeling it in my calves but overall it wasn't enough to make me walk. As there were two laps of the run I knew what I'd be expecting for the second lap. I managed to keep my pace up for the second lap and as the finish was downhill slightly I pushed hard for the last few hundred meters. Crossing the line out of breath I was handed a medal, a bottle of water and banana. I was welcomed by my family and waited for others to finish to see how they did. As it turned out I managed to beat both my rivals even if one of them had the poor excuse that he'd taken a wrong turn on the bike section and ridden further! Very pleased with my performance. Next tri is on 19th August.